Not only are they busy with all of their various productions, by they are constantly fundraising for local charities and have raised around £100,000 for local groups, which is an incredibly effort. This year’s panto was supporting the great work of Stepping Stones, who do amazing work supporting those with learning difficulties. Incidentally, their café in Lisburn (The Courtyard Café) is amazing and I highly recommend their soups. The great thing about amateur dramatics in Northern Ireland, and especially with any Lambeg production, is that they are real family affairs. Indeed one of the families, the Benningtons, were again very well represented with brothers Ian and Paul performing, in very dashing mermaid costumes. Ian’s daughter Karen again took on the role of choreographer, but also directed this year’s show. Sinbad was the third panto that Ian has written, and they seem to go from strength to strength. One great thing about this year’s production was that, as Karen put it, some of their younger members had a chance to shine, and they were all brilliant. The great thing about “one of their own” writing the script, is that it can be tailored to fit the cast. That allowed for brilliant puns such as it being set in Bangoira (the most expensive town in the land, with a backdrop complete with the famous swans) to Sinbad’s mum, Dance Sinbad and his brother, Notso Bad. It all kicked off with Ian and Paul, in very fetching (?) mermaid costumes, complete with bikinis. 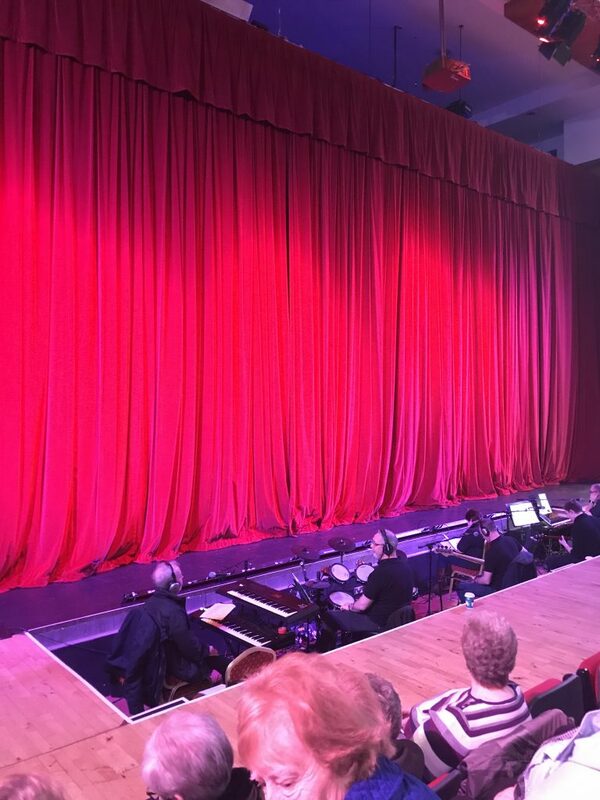 They set the scene for what we would be seeing before the opening musical number, “Jailhouse Rock” and the 60’s theme continued with the Dusty Springfield hit “Little by Little”. “Love Don’t Roam” from Doctor Who was the next musical number before the mermaids took over with “How Far I’ll Go” from the Disney hit Moana. “Treasure” by Bruno Mars was next and what struck me from all of the musical items, but especially this one, was how happy the entire cast looked during all of the musical numbers. As the story developed, the ship that Sinbad, and his brother and mum were on was starting to sink in a storm. As a result, Sinbad said they had to jump overboard. It was at this stage that Laura Kerr (who is usually a regular feature of any Lambeg production but has had to take some time off) arrived on stage with a wooden board… which they then jumped over… get it?? The usual UV slot came next with the Disney hit “Under the Sea” before five guys (not the burgers) were on stage singing a great version of “Mack the Knife”. They were all young adults and did remarkable well, given the challenges of that particular song. The first half finished with a trip back to 1981 with “You Make My Dreams Come True” by Hall and Oates. The second half kicked off with a new one for me, “One” by Harry Nilsson which was made famous by ‘Three Dog Night’ and was first released on 1968. In typical panto fashion, the song that followed was released 26 years later, “That Girl” by McFly. Paul and Ian then sang “Where the Blarney Roses Grow” in lovely harmony together before “What About Us” from Pink before it was back to the 90’s with “Spice Up Your Life” by the Spice Girls and then Fleetwood Mac and “Don’t Stop” from the 70’s. The traditional song that they get children up for was “Splish Splash” by Bobby Darin from the 1950’s. One of those was Jonathan, who is the grandson of one of our family friends. 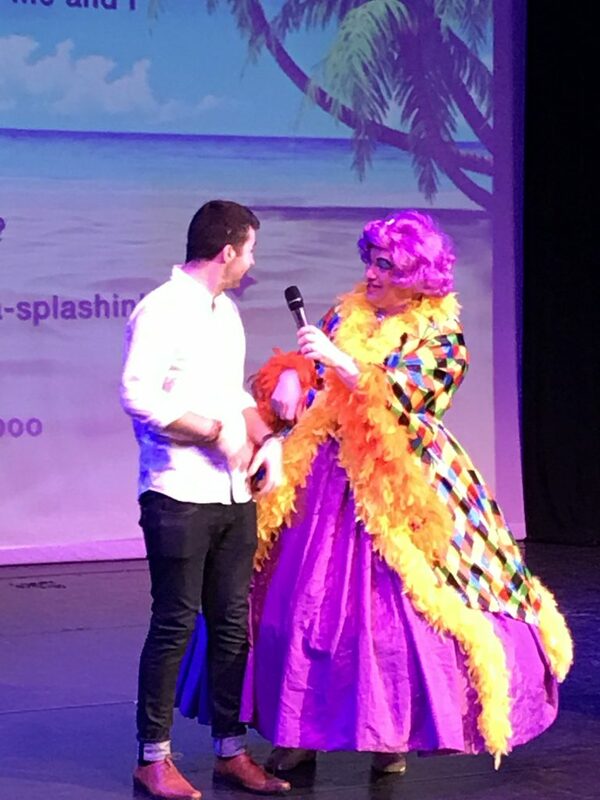 He had been the brunt of jokes from the Dame for the most of the show, but it was still a surprise, mostly to Jonathan, that he was asked (ordered?) up. During the usual ‘shout outs’ we got a lovely mention from Karen for our 25th year, which was lovely. “Joy” by Will Young was the penultimate musical number, before a reprise of “That Girl” for the walkdown. From writing this, the one thing that has struck me has been the vast difference in the songs that Karen chose. They range from the fifties to the noughties and fitted in with the overall story so well. The Lambeg Players seem to have some bizarre hold over me, as every production I leave, I always say “that was the best yet”. Despite the younger than normal cast, this year’s production was again brilliant and it is great to see young people so engaged. Everyone involved in the Lambeg Players – from the committee, production team, sound and lighting team, the musicians, the backstage crew, those involved in costumes and props and the cast – have such a passion for drama and their passion is always so evident.